Fox’s choice of attire around the house has given me plenty of practice free-handing decent Hawaiian shirts. Guess he’s had his fill of jokers. Would it be a bat-baseball bat? It’s just because Batman can make anything funny. So many jokes in one comic. I don’t know how you do it, but keep doing it. Wait…how does his coat even work if his wings are attached to his arms? *long sigh* I’ve had too much beer to read our comics. I spotted the same issue, but actually (and amazingly I’m not kidding) I’ve thought about this specific issue once before. I determined after a lot of thought that anthropomorphic bats would either have a few wing piercings near the arm that they could thread strings through to tie the half-sleeve on, or they would have to sheathe the entire wing in a wide sleeve (clearly not the case here). The robin’s hoody sleeves seem to be extra wide and pushed up past the elbow. Governed by the same rules as genetics. Those poor underprivileged children. Why don’t they get boots or shoes for the winter? Actually this is a quite serious thing I mean things like this really hurt a guys feelings. Who is the bird next to the bat? Personally I find it more annoying when hearing pre-schoolers singing that bastardized version of the song. Batman may be my favorite super hero, but as I’ve always been that not-quite-nerdy-and-not-quite-geeky kid that everyone dislikes there is a very definite limit to how much I can let that song bother me. So much adorableness in one comic. especially that bat. man you’re art just keeps getting better and better. You mean batter and batter? I have reading this comics long enough and I have this one interesting question (for me off-course) which is not related to the current comic. 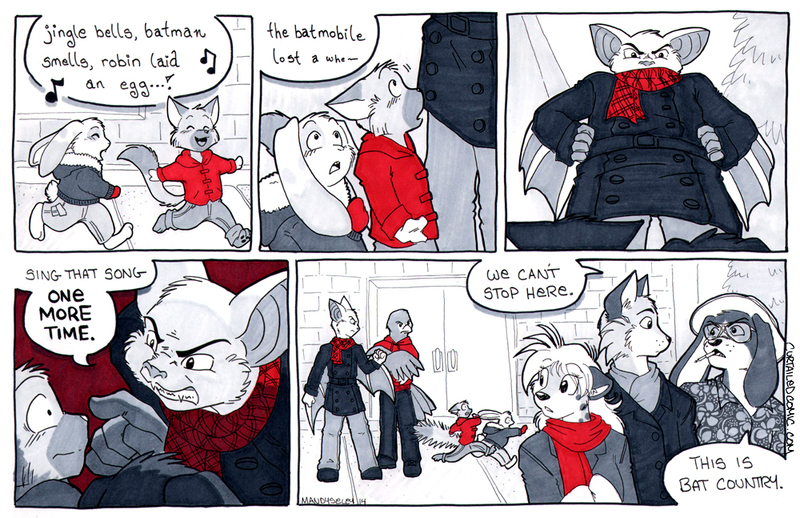 Fox appears tall here, so, how tall is Fox (both the real Fox and the Fox character here in thus web comic)? The punchline went over my head, so I had to Google. http://knowyourmeme.com/memes/we-cant-stop-here-this-is-bat-country explains it all, including the cigarette. That’s OK–I don’t think Mandy got it either. This entire comic was just my mind on overdrive and bouncing between puns and references. I’d already had the first part written down and just started laughing in the kitchen when I thought of the last part. Have you ever considered adding Patreon to your site? I’ve seen it on some other comics I like, and it seems to be working out pretty well for them. Long answer: Patreon does well for creators who can provide additional content to their backers on a regular basis. It’s not a set-and-forget thing like a Paypal button or even Project Wonderful adverts, it’s an additional long-term responsibility and one more thing to maintain and stay on top of. It’s tempting, but I’ve already got my hands full with the comic itself, my day job, and various other responsibilities — so it’s something I’m giving myself plenty of time to think about, first. Mandy….I agree with King Crimson…..your artwork is incredible, and just keeps getting better.